I understand that FK Krasnodar will be a rather unknown quantity to the majority of readers (and to me also!) – I recommend KonzeptFussball’s good analysis of the Russian side by Eduard Schmidt. Travelling to the Westfalenstadion, the Russian side fielded a 4-1-4-1 formation which had an emphasis on forcing wide passing in Dortmund’s build-up with fast counter-attacking in possession. On the other hand, Tuchel’s chosen line-up had a few differences to the XI we have become accustomed to in his start at Dortmund. Against Odds BK the coach made some adaptions too, as he will have to be intelligent in balancing the added work of the Europa League in what is his first season with this problem. Weidenfeller took his place as the cup-goalkeeper ahead of Roman Burki whilst the back 4 was relatively unchanged where each player has impressed well. Not least of which Matthias Ginter who had another productive performance at right-back as he is putting up a considerable challenge for Lukasz Piszczek. In midfield however, there were notable changes. Although the ever-fantastic Ilkay Gundogan started, Weigl was to be found on the bench as Gonzalo Castro came into the side. With this, Gundogan moved to a more central position whilst Castro moved to the right half-space, where Gundogan has been so excellent so far this campaign. Shinji Kagawa was also rested to the bench so Mkhitaryan moved to a central 10 position as Joo-Ho occupied his usual half-left position with Januzaj on the opposite right. The Armenian has been one of Dortmund’s best players so far though he had a disappointing game against Krasnodar, primarily due to a change in his role for Tuchel’s possession game. Up top, Aubameyang maintained his place but was later to be replaced by Adrian Ramos. The match immediately after I upload my analysis of BVB’s great possession game – they put in a poor performance. Typical. Tuchel’s inevitable changes in personnel had a negative effect on his side’s performance with the ball, as the shift in roles made more a worse-co-ordinated structure with less connections, central presence and spacing amongst other issues. Without Weigl in deep positions, Dortmund’s build-up was often more disconnected and had a worse structure to play through. The young new-signing has been crucial in their system so far as he has excellent intelligence in his positioning and movement which allows him to occupy crucial spaces dependent on the ball position. Castro simply couldn’t replicate his teammates’ effect and nor could he copy the brilliance of his midfield partner meaning that from the kick-off, Dortmund’s midfield were at a loss. In some cases, Castro’s presence caused issues on its own for Dortmund. His positioning at times was maladaptive to the structure which caused issues in the movement and development of the ball from the defence. In a couple of cases, the new signing from Bayer Leverkusen was Xabi Alonso-esque in the positions he took up. Numerous issues can be seen in this moment of BVB possession. Although multiple topics can be said about this one moment, I will refrain from going in-depth to save from this becoming a screenshot-analysis. We can see though how Castro’s position near to the ball, and in-between Gundogan and Ginter cut off the passing option and make it for 1-less possible passing lane to be created. Effectively one could consider this as cancelling out a BVB player and making it 10v9 in favour of Krasnodar in the middle of the pitch. Shortly, note Dortmund’s lack of presence in the middle of the pitch too, whilst they have 3 players high up against the defensive line – one being Mkhitaryan! During this scene, the Armenian’s skills are completely wasted though this is something I will talk later on. In the above moment, the lack of central presence was a warning of things to come, as quite often the structure was, I doubt intentionally, oriented to possession focused in the wide areas. Although Tuchel’s system is oriented mainly around the left half-space, the centre is key (as in every system bar David Moyes’ United) and their under-utilisation of the space in this game caused issues. An interesting feature of the system for this game is the role of new signing Joo-Ho. With Schmelzer at left-back and Mkhitaryan as the 10, the Korean acted in the left half-space. In Dortmund’s build-up, he would drop vertically in the half-space in an attempt to form connections – most likely in an attempt to counter the absence of Julian Weigl as he generally acts in similar spaces. Joo-Ho wasn’t as ball-oriented as Weigl usually is however and doesn’t possess the same intelligence which allows the ex-1860 Munich player to fulfill his role so well. During deep Dortmund possession, another issue was that of Mkhitaryan and Januzaj’s movement. Neither would drop to support the structure and although they still had Joo-Ho and Gundogan in deeper roles, the possession was still rather isolated. One could also make a claim for Castro’s lack of effective involvement but he was just a part in a problem which was relative to the collective structure. Considering Mkhitaryan’s effectiveness in a role that is so perfectly suited to his skillset, it was interesting to see him take a very much different one against Krasnodar; even with the numerous rotations in midfield. In the centre of the ‘3’, he was less-oriented to forming the connections and instead he played much higher up at times acting exclusively in possession in an advanced position. 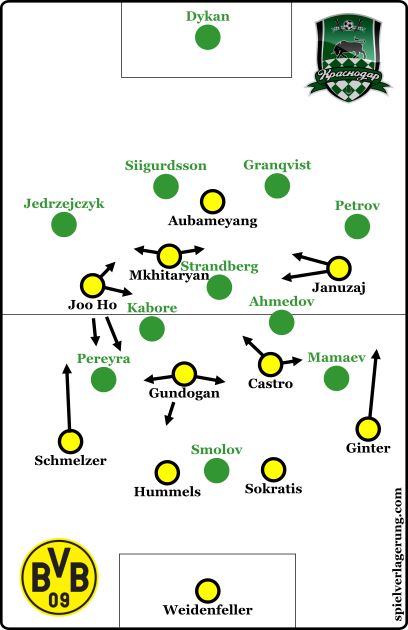 Similarly to the above graphic which focused on Castro, Mkhitaryan is disconnected from the rest of the team. As I have mentioned, his lack of deep involvement was an issue but there was also issues when he became involved higher up. As he was close to Aubameyang and frequently far behind the Krasnodar midfield line, a common method of access was long vertical passes. With Dortmund’s new positional play, this meant that he was disconnected from the main structure and upon receiving the ball had to rely on individual moves. As I mentioned in the team analysis, this ignores his collective-oriented strengths and was similar to his time last year, where he could only be found isolated on the flanks. The length of these vertical passes were also an issue. Because of the worse structure, Dortmund struggled to progress the ball into midfield with stability to many of these passes were from Hummels. Despite their impressive accuracy, the length of the pass meant that Krasnodar could always prepare an effective press, making the most of some good spatial compactness from the Russian side. As the first half progressed, Dortmund gradually improved despite not much change in the system. They began to get better access to central positions higher up the pitch and thus, Mkhitaryan became more influential. Although the combinations and overall output wasn’t as much as that in his original it was an improvement on his absence in the opening stages of the match. The main change which improved Dortmund and their use of Mkhitaryan was Kagawa’s introduction though this is something I will touch on towards the end of the analysis. Krasnodar with a defensive block focused on the centre and half-spaces. For all of this talk of Dortmund’s self-inflicted issues, credit must be given to Krasnodar’s competent defensive performance. In their 4-1-4-1 shape, they had the intentions of forcing Dortmund to building possession in wide areas without central access which worked well. Dortmund only use the touchline in higher possession and never willingly in the first phase so an interesting ‘battle’ between Dortmund looking to develop centrally and Krasnodar showing them wide happened. The visitor’s used a man-marking scheme which was effective for most of the first half due to Dortmund’s lacking structure but was then exploited once Tuchel’s men improved. Had Mkhitaryan been more active in deep possession as well as the midfield as a group being generally more ball-oriented whilst it was with the defence, I don’t think the man-marking would have been as effective but that is all hypothetical. One of the stronger features of Krasnodar’s defensive organisation was their strong spatial compactness. This is the level of compactness within the defensive block. For example, a team can have small distance between the highest and deepest but still have open spaces within the shape, thus they are vertically compact but not spatially. With little open space within the defensive block, the Russians were effective in isolating Mkhitaryan and this was a key feature in Dortmund’s lack of access into such spaces early on in the game. 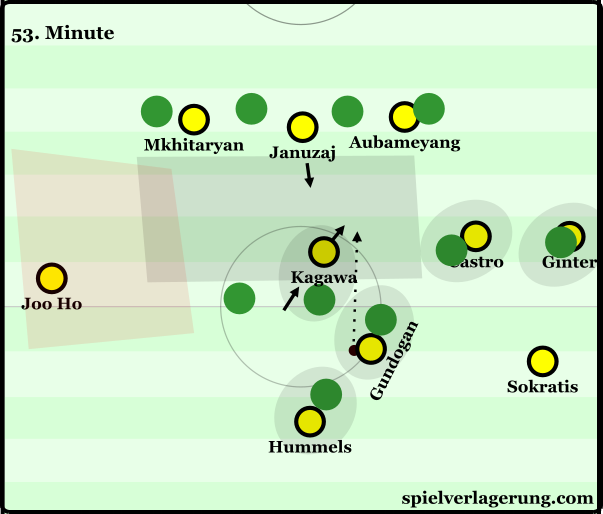 As Dortmund made changes, the likes of Kagawa worked well in opening the spaces through their actions as needle players in the midfield. The coach clearly identified the issues which Dortmund had throughout the first half and looked to amend them by replacing Schmelzer with the initially-rested Shinji Kagawa. Joo-Ho moved to left-back whilst Kagawa acted in similar positions to the South-Korean but with a more attacking role and he did so more effectively too. I was surprised that we didn’t see a direct swap between Mkhitaryan and Kagawa which would’ve meant for a shape much closer to what we see in Bundesliga matches but Mkhitaryan maintained his central role. Perhaps Tuchel still had the intentions of experimenting with this alternative for the Armenian. He did improve however with the support of Kagawa as well as Januzaj who moved more central. With more players around him, especially such technical ones as the Japanese 10, Dortmund made greater use of his ability to support others through combinations and connections. Completely open wide space? Gundogan prefers to open the centre with a midfield-splitting reverse pass. Kagawa, and the small change in midfield structure which he brought, got more out of Gundogan too whose passing was effective in exposing the space which was now being opened. In the first half, Dortmund struggled to access the centre mainly because their structure didn’t create much presence there with Mkhitaryan high and Januzaj wider, as well as impressive defending from Krasnodar. In the second half, Kagawa counterbalanced Mkhitaryan’s positioning to some degree whilst Januzaj came more central and Dortmund could then penetrate the centre better, making use of Gundogan’s superior passing. With Kagawa, Dortmund did move slightly closer to their usual system and we saw them being more oriented collectively around the left half-space too, which Schmelzer’s replacement was crucial in. Their usual overloads started to form around this area and Krasnodar struggled to cope with Kagawa whilst Mkhitaryan’s involvement increased. This was then furthered when Weigl came into the game for Castro in the 60th minute. He slotted into a familiar role, deep in midfield and again put in a good performance – his first action being a penetrating pass into the midfield. Collectively, there were a few changes, one of the main ones being the space used in possession. Dortmund were more strongly focused on using the centre and left half-space whilst more importantly, not using the wings. Krasnodar’s tiring defence perhaps had a part to play as well as the introduction of Kagawa and then Weigl but the change was primarily a collective one as their access improved. It seems like Tuchel gave a direct instruction to his players at half-time not only to develop these overloads more, but to exploit the underloaded side too. Ginter wasn’t utilised in the first 45 as much as we have seen in games such as against Ingolstadt, where he played a key role in the overall attacking strategy. However, following the break we began to see the likes of Kagawa immediately look over to his flank upon receiving possession in a congested left half-space. Although not in their usual fashion, it was a Ginter cross from a small isolation which assisted Joo-Ho’s late winner. Although Dortmund’s system initially failed, appropriate changes fixed the majority of the issues and Dortmund made yet another come-back in the Europa League. It is difficult to say if Dortmund would’ve done the same last year as we saw a few losses after going a goal down early. Whilst Tuchel’s albeit forced changes were the cause of their troubles, his changes did well to fix that and he should be given credit. All eyes are now on Sunday’s clash against Leverkusen. It will likely be the first game against very strong opposition and it will be an interesting clash of systems, with Tuchel’s newly introduced positional play against the intensity that Schmidt brought from Salzburg. Thanks for the continuous analyzing of BVB, TP! Especially the lengthy team analysis was sublime! Then about this EL match: My impression so far is that in the Buli Tuchel always plays his strongest system and team, while he apparently considers the EL opponents weak enough to freely tweak the system to try out alternate approaches, let set players play unusual roles and bench players garner playing time. Specifically for this match I got the impression that Tuchel wanted to make another go at trying to find a workable system for Castro, and have Mkhitaryan play more statically in the center (probably not so much for his own good but to train and enforce more fitting movements from the players around him). Castro is a special case considering he participated in all pre-season mostly playing in what’s now Kagawa’s position. After the failure that was his role at RFB in the previous EL matches (a still successful experiment as it brought to light that Ginter is a much better fit as a RFB than e.g. Can) he now got to share a 6 along with Gündogan. My interpretation was that Gündogan was supposed to play the reserved role of Weigl, with Castro slotting into Gündogan’s more box-to-box-ish role (as shown in your starting formation pic). But Castro interpreted his role in a way too offensive way, essentially creating a constant overload on the right wing side, but without him or the team around him making positive use of it. This created a chain reaction of movements for the defensive minded balance players: Gündogan moved more centrally to the right to cover the area left behind by Castro, exposing a huge gap in the half space behind Park. Park then dropped deeper to fill out said gap. Unlike the analysis notes I don’t think at all it was the intention for Park to fill out a Weigl role. Instead due to Castro’s bad movements in the right half space and Gündogan’s adaption to it Park ended up having to rail alone in the left half space lane, balancing the positioning between Gündogan and Schmelzer. As that’s two players doing essentially the same work on the far left side Park fully replaced Schmelzer for the second half. My conclusion of this match was that new players like Park and Januzaj will have no bigger issues slotting into any existing system, their strengths are well defined and they adapt to their surrounding teammates reasonably well. Both Park and Ginter had a great understanding of each other’s movements on the wings which was a joy to watch, directly leading to the two goals, a nice option to have should Tuchel ever want to enforce wing play some more. Castro on the other hand appears to be a fully unplayable player. Now with this match he got to try out three totally different roles as a starter, and in every single one of these roles he managed to make a mess of the defensive part while constantly throwing a monkey wrench into his team’s offensive movements. As for Park I want to see him actually play in Weigl’s position once as out of all players BVB has I deem Park the most capable of replicating his current role. Due to Weigl’s huge importance to the currently highly successful system having a reserve player as a possible direct replacement would be a huge boon.